Some teams performed particularly well in their biggest race, while some struggled, which accounts for the big movements in the rankings. Mayfield, and Flintridge Sacred Heart had particularly good days at CIF Finals after so-so league meets. Arcadia and California ran really well at Prelims, but failed to advance in the brutally difficult CIF-SS Div. 1. #5 South Pasadena were unranked in our Pre-Season Rankings (see below) so they made the biggest jump over the season. 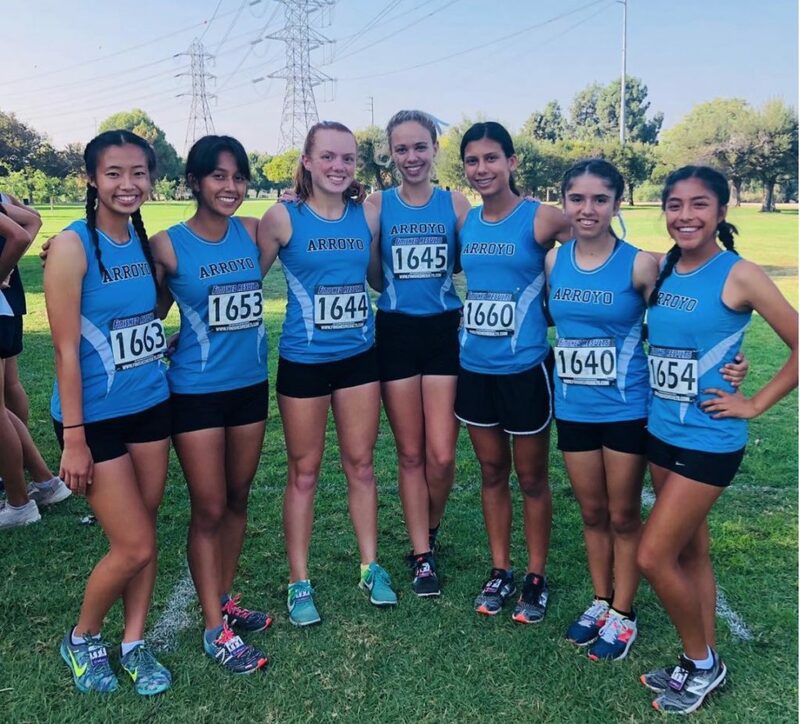 Led by two strong frosh and excellent progress from the remaining girls, the Tigers were league champs and 9th in CIF-SS Div. 4. #6 Arroyo were the other big movers. Ranked 14th at the start of the year, they defended the league title and returned again to CIF Finals. They had a strong team progression and finished well despite missing their #2 to injury. They’ll return six of their first seven next year. After the jump, the final merge with its rationale, along with the pre-season rankings. These rankings are meant to show what would happen if the top teams of our region had competed in the same race, against only each other. Rather than each team’s best race or optimal race, they’re based on their actual results in each team’s most important race of the season – their final race. 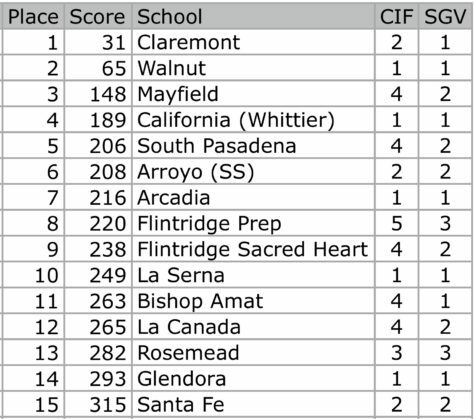 Specifically, these rankings are based on a merge of the final race (through CIF Finals) of the top 20 teams, and then a second merge of the the 15 teams from that top 20. 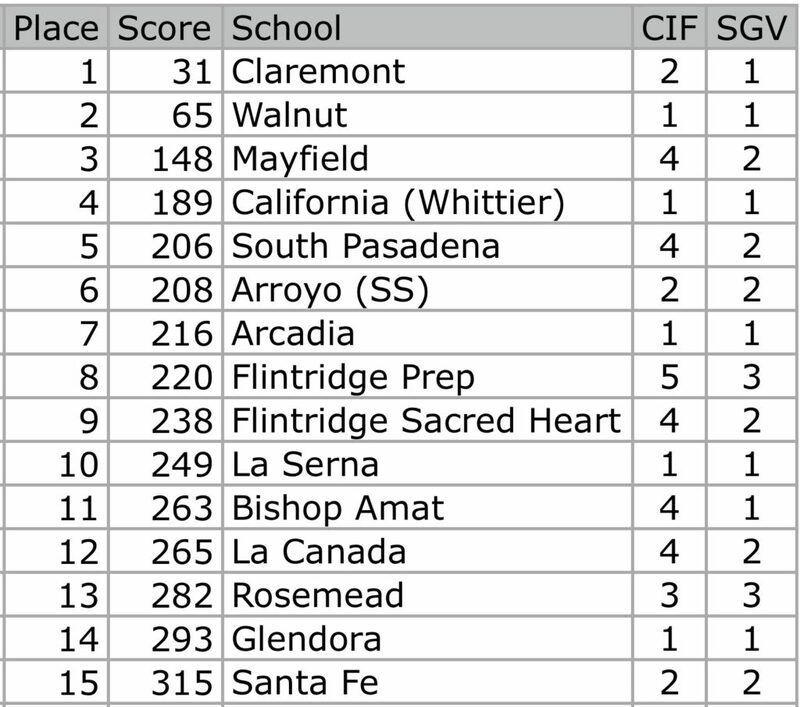 The rankings are adjusted for courses and weather, but since Glendora was the only team here that did not advance to CIF, those adjustments were minimal. Also, in the final two columns, “CIF” is each school’s assignment in the CIF-SS’s five, enrollment-based divisions. “SGV” indicates a school’s place in a new, three division classification for the SGV that adjusts school sizes to reflect demographic factors.